Can you identify the house or the children in this photograph? A black and white negative of the front of an unidentified house. 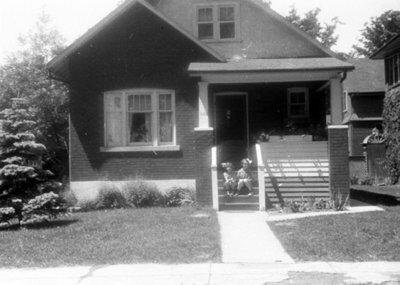 Two children are sitting on the porch stairs. Unidentified House, c.1936, Marjorie Ruddy. Whitby Archives A2013_040_147A.